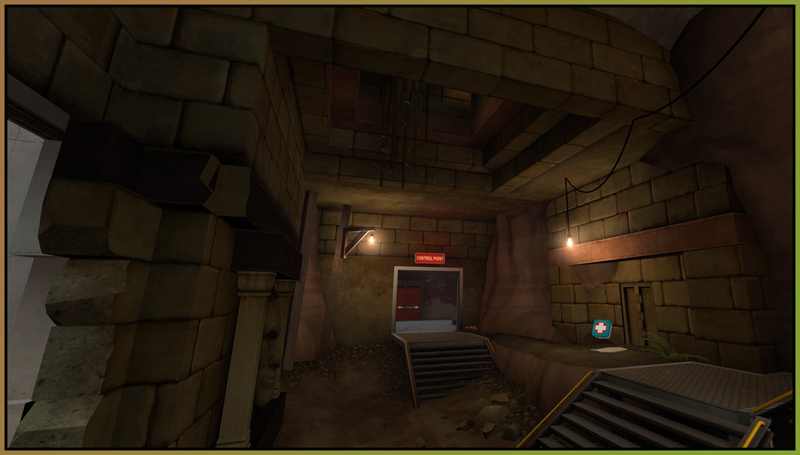 Gameplay changes to the transition from the mid point buildings to the second point are the central purpose of this version of the map. Defenders holding on top of the second point had both a strong height advantage and were able to watch all entrances, so this update attempts to resolve that. The map has also seen additional optimization, though for obvious reasons this is not demonstrated in the images. While the angled roof models were fairly lightweight resource-wise, when rendered en masse these could still add up quickly. Antiquity is filled with these roof pieces as they're pivotal to the theme. These were given LODs ('level of detail') to reduce their framerate impact. 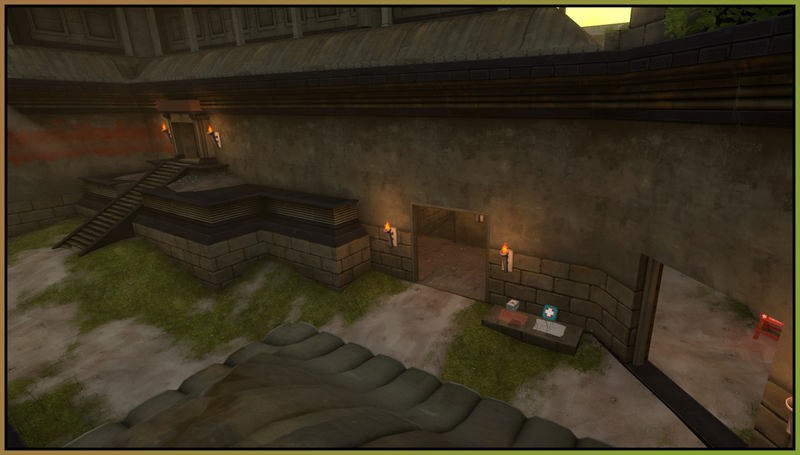 Hint brushes and areaportals were also tweaked to squeeze a bit more performance out of the map. While pub players enjoyed being able to roam around the circumference of the middle point, the platforms with the small healthkits were an extremely strong spot to hold against repushes into mid. 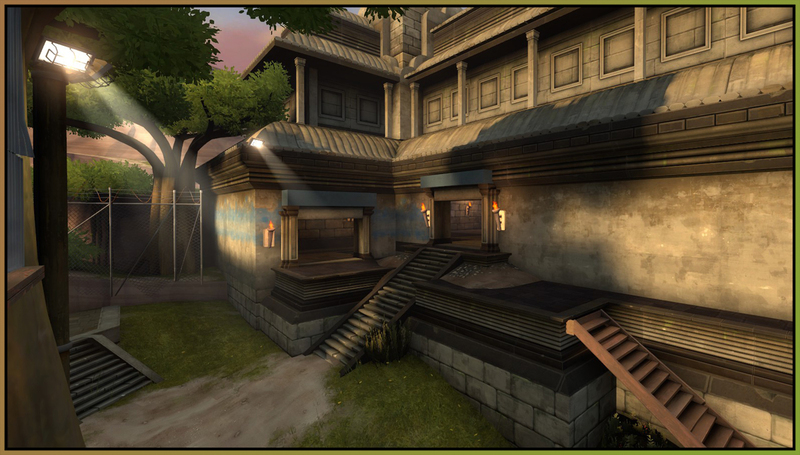 A coordinated competitive team could park their medic there, keep the highground, and lock down the entrances into mid. For obvious reasons, this was unacceptable, so the platforms were removed. In their place are purely decorative steep roof pieces which are clipped off so players can no longer stand or traverse them. 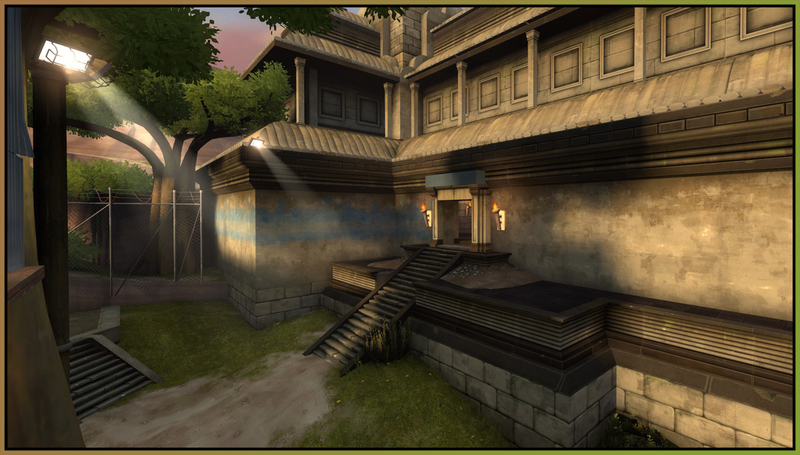 A small fence was also added on the ground level to block snipers from hiding inside the building and shooting across the point through the side entrance. 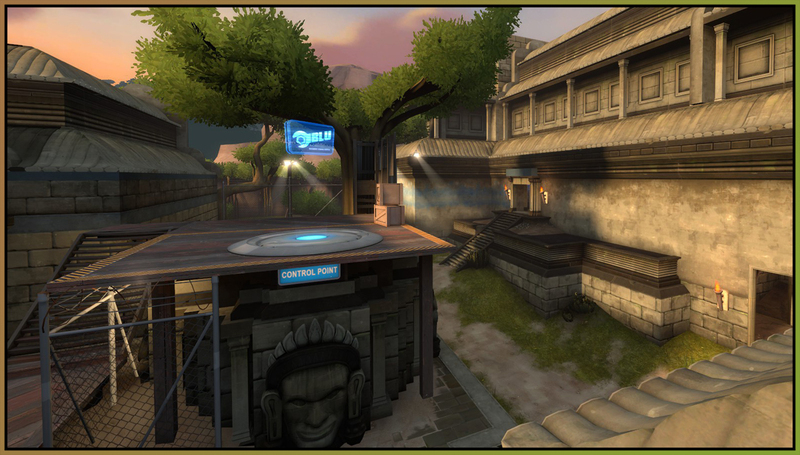 Some of the most important changes to this version of the map are shown here. 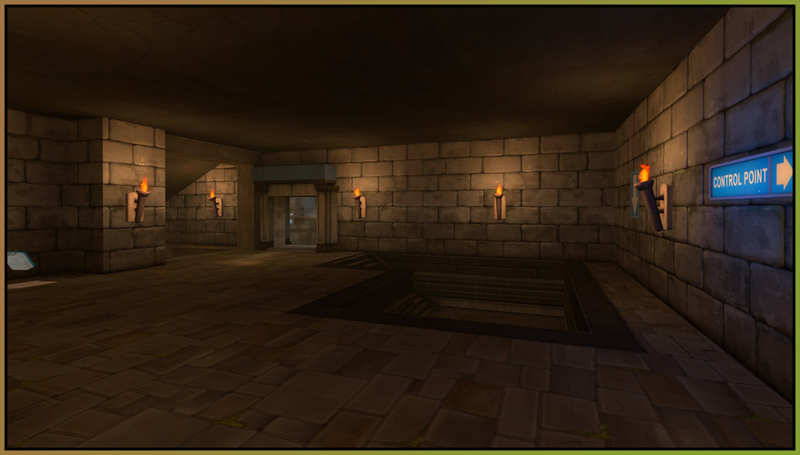 The entrance on the top of the stairs was turned into a split entrance, and both portals were widened. On the ground level, the large entrance near the health and ammo was sealed off. 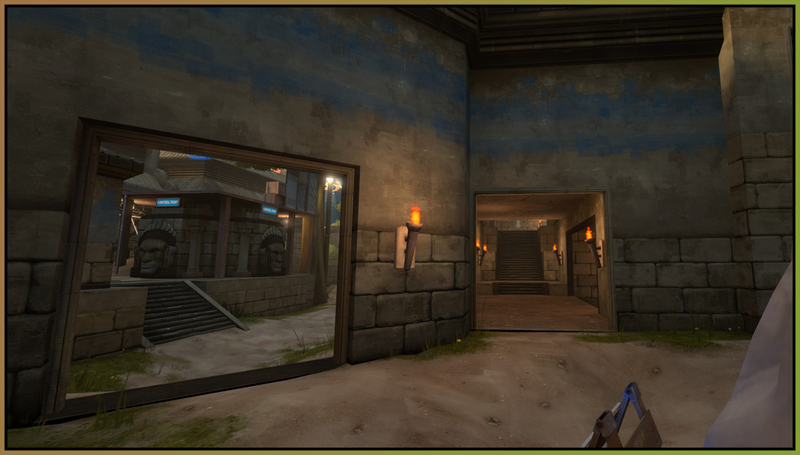 With the garden cave entrance from the previous versions of the map, these changes now force defenders on the point to constantly rotate to see all entrances from mid if they wish to maintain the high ground. A wood pile was added onto the point to help prevent grenade spam from easily rolling off. These doors are now 192 hammer units wide, which is the same as the widest doors on popular competitive maps such as Badlands. 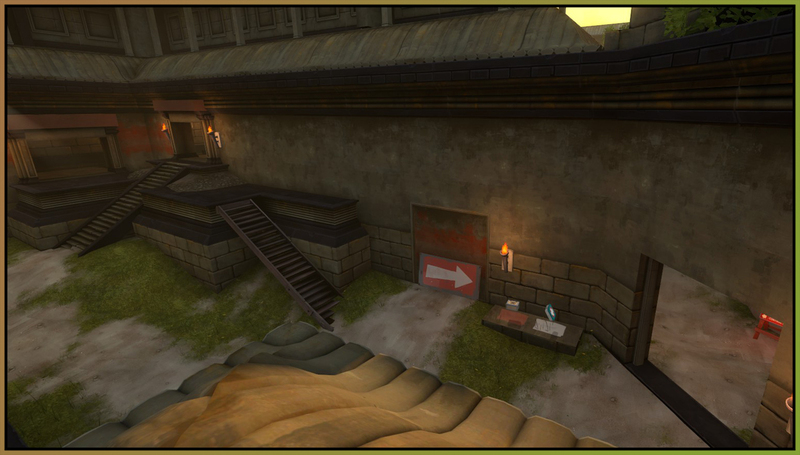 Vhalin suggested this specific change, though his suggestion had one of the split entrances on the wall closest to the fences. 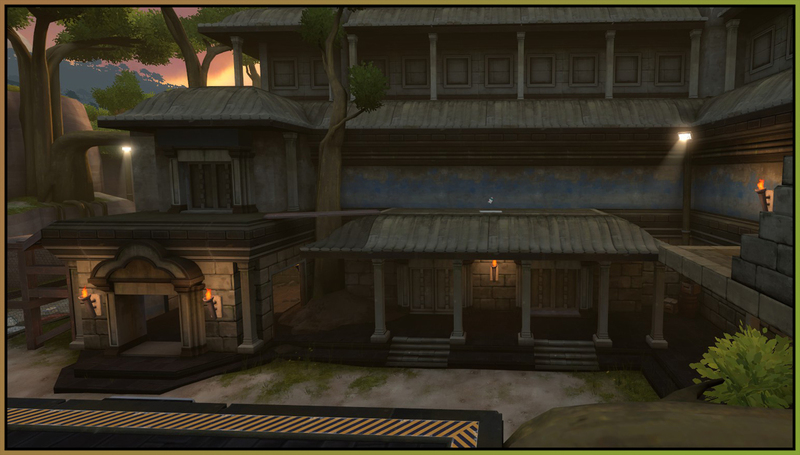 Unfortunately, this proved to be too hard to optimize as it allowed more areas of the map to render. Additionally it created a long sightline into the lower interior corridor, making that route less useful, so I opted for this variant of Vhalin's suggestion. Hopefully it is still an improvement. Wooden stairs provide another access point from the ground up to this raised platform. Besides increasing the width of the doorframes, the stone frame at the top of the stairs was removed. It was purely decorative and only created an extra unneeded obstacle to navigate. With the large entrance into the second point sealed off, the interior area could be opened up considerably. This has the side effect of being one less set of corners for advancing players to check. A side route into the garden path area was added, giving players a good way to wrap around either directly into the second point or further through the cave route added in version B16. 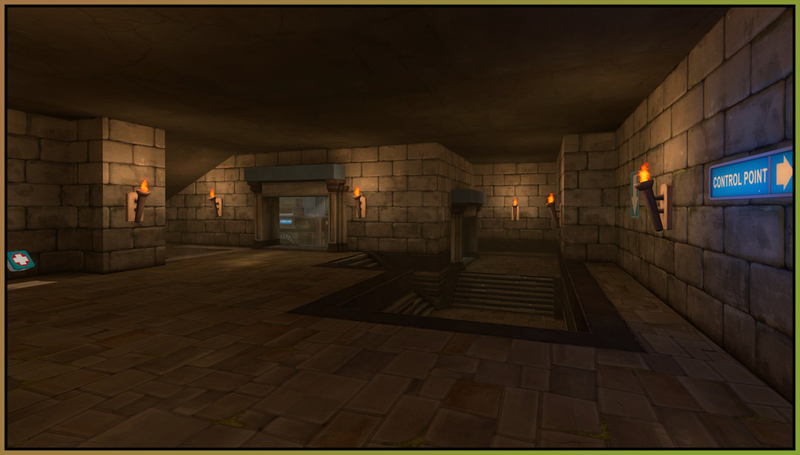 In the previous versions, the main entrance out of the second point was very intuitive to newcomers. They left their forward spawn and saw this large door directly in front of them which took them straight to the middle point. Since that's sealed now, a big arrow billboard was put in to help compensate. It's not quite as intuitive as simply having a large entrance there, but it should suffice. A minor aesthetic change is the addition of a particle effect on the deadfalls. Some drips of water, a little debris floating down, and some faint sunlight add an extra bit of polish. It's a subtle effect for certain, and more noticeable in motion. This particle effect is also flagged as 'weather,' which means most competitive and framerate-conscious players will not even see these as turning off weather effects is common in game configs.